The Southwind is a 50' all aluminum vessel powered by twin turbocharged 735 HP Detroit Diesel engines. She's equipped with modern electronics, a 10KW diesel generator, clean and roomy head, and comfortable seating in a climate controlled cabin. This vessel has been refitted for dive operations, and features extra deep benches, a fins on ladder, and plenty of room to stow your gear. All that and she can cruise at 30 knots! 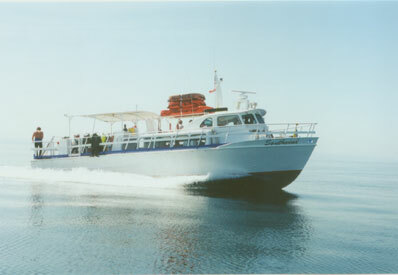 The Southwind is Coast Guard inspected and certified for up to 49 passengers, or 30 divers.